Agilent Technologies has produced a technical overview describing how to combine UV- and mass-based fraction detection with recovery collection for confident, successful sample purification. Peak-based fraction collection triggered by a UV signal threshold leads to satisfactory results in most cases. Some samples and applications, however, require special attention when fraction collection parameters are set. This Technical Overview describes different strategies on how to achieve best collection results using different settings on an Agilent 1260 Infinity II Preparative LC/MSD System. UV and mass-based fraction collection, fraction pooling, as well as recovery collection are discussed in detail to provide knowledge that can be turned into successful and confident fraction collection. To get the most out of the 1260 Infinity II Preparative LC/MSD System, fraction collection parameters need to be set properly. Although, in most cases, simple peak-based fraction collection triggered by the signal of an ultraviolet (UV) detector will produce satisfactory results, some scenarios might require special attention during method setup. 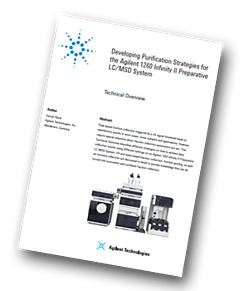 This technical overview demonstrates different strategies on how to exploit the vast possibilities of the Agilent OpenLAB CDS ChemStation software to succeed with fraction collection even with challenging samples. Peak-based fraction collection is the most straightforward way to collect all components of a sample without specific focus on a main compound. Fraction starts are usually triggered by exceeding a signal threshold that is defined in the method of the fraction collector. To achieve the highest recovery of the compounds, this threshold should be set very low. In some cases, however, fraction collection triggered by signal threshold can fail. Depending on the wavelength of the UV detector, the absorbance of the solvent can become visible towards the end of a gradient with increasing organic solvent percentage. This can cause the baseline to rise above the threshold and trigger continuous fraction collection. a 1260 Infinity II Preparative LC/MS System has to offer.